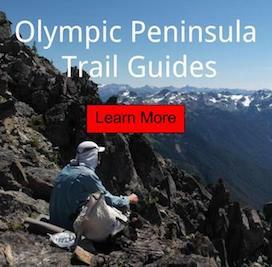 The Annual Olympic National Park Pass allows a visitor to visit the park for one year from the time of purchase. Generally you show it to a Park ranger with a valid I.D., and that gets you into any access road with a toll booth. The card expires one year from the date of purchase. The pass I'll be featured on is the centennial edition. It is in celebration of the 100 year birthday (August 25, 2016) of the National Park Service. This is quite an honor! In 2016 through 2017 look for one of my images on this annual entrance pass. I won a little contest on social media a few months back, and I was honored to hear that my image was selected. It is a personal achievement of mine, because I'm so obsessed with the Olympic Mountains. The selected image was taken this last summer, on a 6 day backpacking trip into Queets Basin. This trip included 4 days off trail in the steep Olympic alpine and requires basic mountaineering skills. The photograph features the Humes glacier of Mount Olympus and the dramatic landscape of the upper Queets drainage. I was not too happy to be my heavy camera equipment into the mountains, that hot and dry week in summer. However, once in camp, it's nice to have a real camera to go explore the surrounding area. This photo was taken at sunrise from outside my tent; hesitating to even get out of bed in the first place. This paticular photograph was taken with my Fuji X-T1 with 14mm lens, at F22, with a shutter time of 4.5 seconds. A polarizer and graduated neutral density filter was also used. Curious about how to take awesome mountain photos? Learn more about my camera kit!